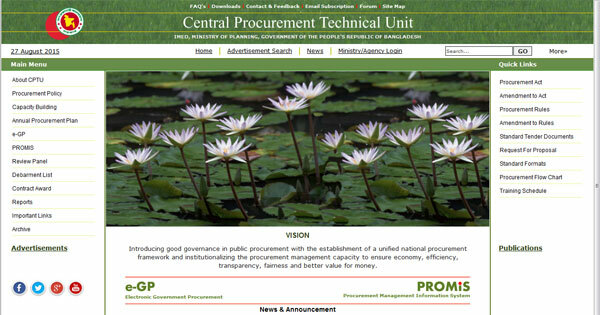 The CPTU Website aims to support an effective and transparent procurement market by encouraging suppliers and contracting entities to adopt best practices and use information technology to provide all the information needed to deliver value for money in public procurement. For suppliers this site shall give background information about the procurement market and links to other sites with appropriate information about procurement opportunities across Bangladesh and beyond. For the procurement professionals, the website shall present background information on regulations and procedures, host discussion forums on how to improve procurement skills and to provide links to different sources on best practices. The site will include among others design of Training plan for activities related to capacity building in procurement; Standard Documents; Debarment list; Discussion forum; Frequently asked questions; and Search Engine .